Perishing alone in space—in a gaseous cloud of stench—ranks pretty highly on the list of Terrible Ways to Die. 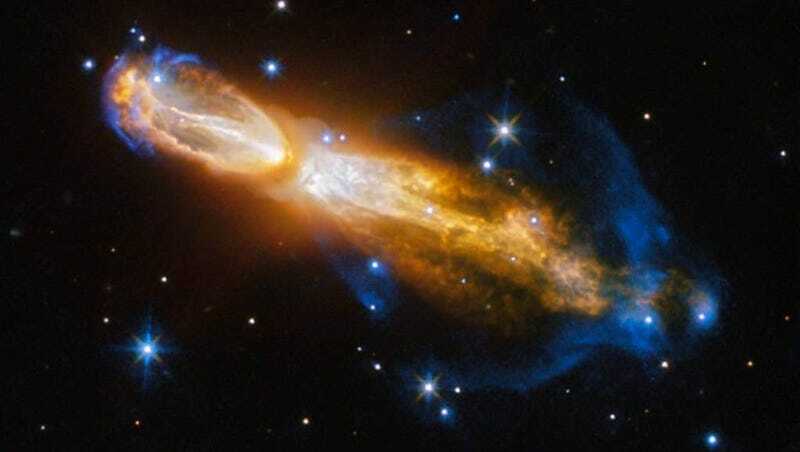 Sadly, that was the fate of one unfortunate star trapped in the Calabash Nebula, nicknamed the “Rotten Egg Nebula” due to its high sulphur content. If you’ve ever smelled sulphur—or dog farts—you already understand the name. The above image was captured in January by the Hubble Space Telescope. It’s very rare to see a star in this phase of its death, since the evolution from red giant to planetary nebula happens extremely fast. As the star dies, it ejects material in all directions at rapid-fire speed. The yellow clouds seen in the picture move at about 1,000,000 kilometers per hour. In the next 1,000 years, the nebula will become a shell of ionized gas known as a planetary nebula. While the resulting image is nothing short of stunning, let’s not forget it’s located over 5,000 lightyears away in the constellation of Puppis, AKA “The Poop Deck.” Gross.